Martin Kiely is a full-time National Guild of Hypnotists (NGH) consulting hypnotist practicing in Cork, Ireland, since 1989. He maintains a highly successful hypnosis practice and professional hypnotism training centre. Martin is the first National Guild of Hypnotists Board Certified Hypnotist and Certified Instructor in Ireland. He was honoured by being featured on the cover of The National Guild of Hypnotists prestigious Journal of Hypnotism, June 2004. In 2006, he received international recognition for his work in the hypnotism profession. During the banquet and awards ceremony at the National Guild of Hypnotists annual convention and educational conference held at the Best Western Royal Plaza Hotel, Marlborough, Massachusetts, USA, NGH president Dr. Dwight Damon presented Martin with the International Visionary Award. 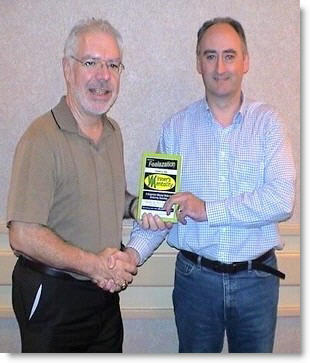 Early in 2008 Martin founded the National Guild of Hypnotists Ireland Chapter with students who successfully completed the NGH Consulting Hypnotist Certification training with Martin. He was elected as President of the NGH Ireland Chapter by fellow founding members In 2008 Martin was inducted into the NGH Order of Braid which recognizes a lifetime of outstanding achievement, dedication and service. Martin is the World Hypnotism Day lead for Ireland and the Audio/Video production committee lead for World Hypnotism Day. Martin was a faculty member and presenter at the NGH 2008 convention in Marlborough Massachusetts, USA. 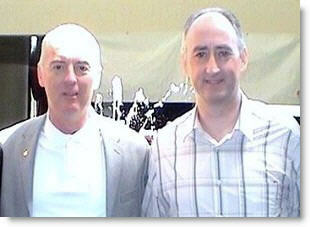 In 2009 Martin was appointed the National Guild of Hypnotists Regional Ambassador for Ireland . NGH consulting hypnotist Martin Kiely from Cork, Ireland, receives the National Guild of Hypnotists highest meritorious award. 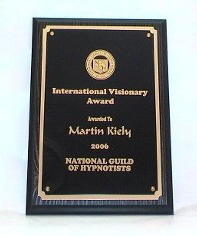 On August 14, 2010, consulting hypnotist Martin Kiely from Cork, Ireland was awarded the ‘Rexford L. North Award’ by Dr. Dwight Damon, President of the National Guild of Hypnotists, the world’s oldest and largest hypnosis organization, with membership of over 10,000 hypnotists in 65 countries worldwide. 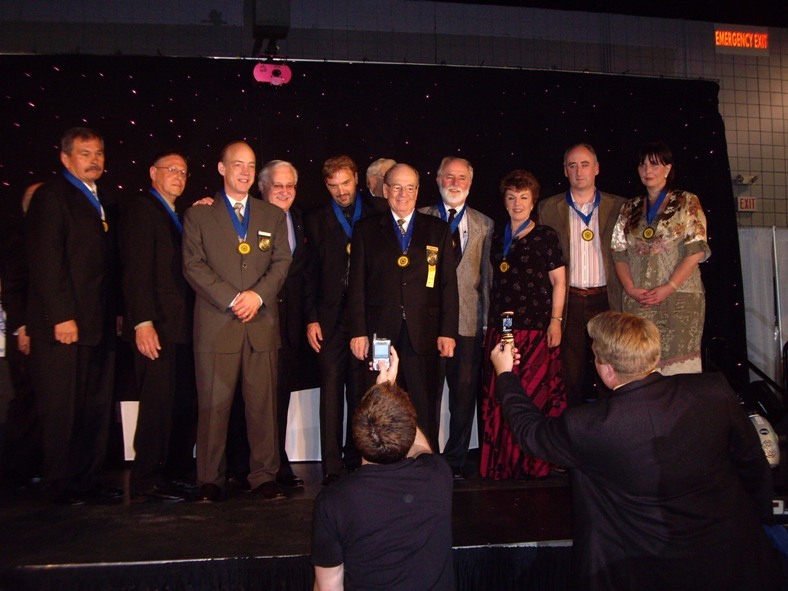 Dr. Rexford L. North Memorial Award is the highest honour given each year by the National Guild of Hypnotists at the Annual Convention and Educational Conference in Marlborough, Massachuestts, USA. 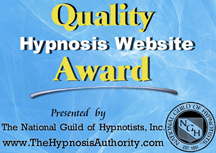 The award is given in memory of the National Guild of Hypnotists founder, Dr. Rexford L. North. 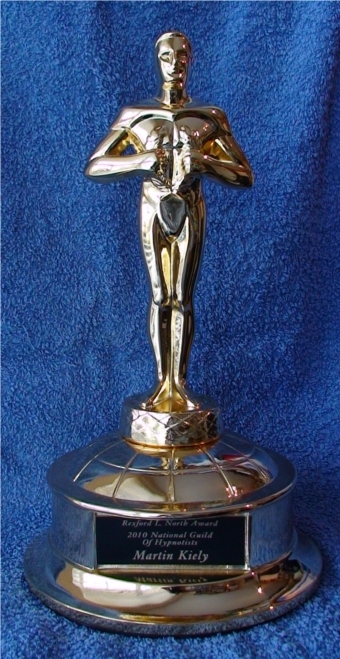 A number of honours and awards are given at the annual convention, with the recipients chosen by their peers and also by a committee. The highest honour bestowed upon a member is the coveted Dr. Rexford L. North Memorial Award given in honour of the NGH founder. At the NGH 2010 Annual Convention and Educational Conference the Guild celebrated 60 years of service worldwide. The largest and oldest organization of its kind, the National Guild of Hypnotists provides a wide range of support and professional development services for hypnotists on every continent. Its mission is, in part, to educate the public about the value of hypnosis and also to continue its leadership role in expanding the profession of a certified consulting hypnotist. Dr. Rexford L. North founded the National Guild of Hypnotists in 1951. 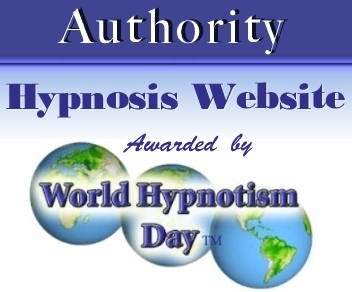 His vision transformed hypnosis, bringing together individual practitioners, entertainers and isolated scientists into a homogeneous body that is now respected by the public, establishing an organization and structure with professional standards and regulations. Hypnotism is an accepted and recognized option regularly utilized by many health care workers, counselors and other mental health professionals. Hypnosis provides a valuable tool for enhancing an individual’s ability to deal with pain or stress, or to assist in diminishing undesirable behaviour patterns. As the use of hypnotism increases, so does the demand for those who are trained to provide it. Sports Hypnotism Certification which provides skills and techniques to become expert in the delivery of hypnotism for enhancing sport performance with athletes, and for practicing interventions for the most common performance issues. Complementary Medical Hypnotist Certification a speciality certification of the NGH to become qualified to work in a medical environment. This training is for complementary hypnotism, which means the use of hypnotism as an adjunct to conventional medical care. Pain Management Hypnosis Certification. Martin trained with Ron Eslinger, CAPT, USN, Retired who is a Certified Registered Nurse Anesthetist, Board Certified Hypnotist and a Certified Master Instructor through the NGH. Martin successfully completed an intensive advanced training on the use of hypnosis as a complementary and integrative treatment of choice for managing chronic pain. Integrating the use of hypnotism, hypnotic techniques and the power of suggestion into pain management treatment is the most flexible non-invasive treatment for pain relief. New research has shown that psychological methods such as hypnosis are more effective for pain management than medications or surgery. Martin is recognized by many in the media as a source for expert opinion in the field of hypnotism hypnotherapy. He has been featured on numerous occasions in the national print media. Also, Martin has appeared on television and has been a guest on national and local radio stations. He regularly meets with medical and health professionals to enhance their knowledge and awareness of hypnosis. He has many published articles and contributes to NGH publications “The Journal of Hypnotism” and the “Hypno-Gram”. NGH Consulting Hypnotist Martin Kiely provides the National Guild of Hypnotists approved professional hypnotism certification training and hypnosis hypnotherapy services for stop smoking, weight control management, stress, confidence, sports motivation and much more. Martin Kiely Hypnosis Centre, Cork, Ireland provides hypnotism hypnotherapy services and instruction in self-hypnosis for clients, motivating them to improve specific aspects of their lives, as well as extended support of a non-medical nature. NGH Consulting Hypnotist Martin Kiely works with clients regarding a medical or mental disease only on written referral or acknowledgement from a licensed medical or mental health professional. Hypnotism may be used either as an adjunct treatment under these professional’s direction or in recommended supporting roles, such as stress or fear reduction and pain management for pre and post-surgery, terminal care, or rehabilitation. Consulting Hypnotist Martin Kiely helps to educate the general public and demystify hypnotism. Ormond McGill known as “The Dean of American Hypnotists.” He is a magician and hypnotist of international reputation, and has toured many parts of the world with his exciting stage shows. Both an authority and a performer, he has written extensively on the subject of hypnotism and has many published books. Dr. Jack Gibson, FRCS. As a surgeon, Dr. Gibson carried out over 4000 procedures using hypnosis. His successful treatment of psychosomatic disorders is legendary. Richard Harte is president of Harte Associates, a management and organisational consulting firm and Executive Director of The Harte Centre for Hypnosis, New York, USA. Richard is a full-time hypnotherapist, teacher and Educational Director of the NGH. Jerry Kein founder of the Omni Hypnosis Training Centre, Deland Florida, USA. Through Omni, Jerry is a world leader in “How To” and “Step By Step” Hypnotism Training. Don Mottin is the director of one of the most successful hypnotism centres in the United States. Don has developed unique techniques that allow him to determine which suggestions have been accepted and why. professional practice, Don has created hundreds of proven strategies, secrets that have resulted in private practice that consistently generates a personal income of more the $100,000 a year. Don loves his work and says there is nothing more rewarding to him than helping other hypnotists boost their success rates and increase their incomes. ob Reese, MA, ATC CH is a Leadership Development Specialist, Executive Success Coach and Certified Peak Performance Specialist who practiced as an Athletic Trainer in the NFL for 25 years. Bob is the author of Train Your Brain and Develop the Winner’s Mentality: Integrating 5 Mental Skills for Lasting Success. Martin studied with Bob and has a speciality Certification in Sports Hypnotism. This certification provides the skills and techniques to become expert in the delivery of hypnotism for enhancing sport performance with athletes, and for practicing interventions for the most common performance issues. Tom Nicoli, BCH, CI, author, speaker and trainer owns and operates A Better You Hypnosis, Inc. in Woburn MA and New England Institute of Hypnosis. He is the author of A Better You by Hypnosis and D.E.P.T.H of Human Behaviour – The Truth About Weight Loss. The success of his programmes had been featured on national and local television, radio and print publications. He was involved in a 10 month weight loss study with Dateline NBC as one of the most successful parts of the study. His client lost 50 pounds while gaining emotional strength, balance and comfort with successful continued maintenance. John Cerbone, Cerbone Hypnosis Institute, Staten Island, New York, works with major corporations including Fortune 500 companies and hospitals hosting standard and custom designed programmes. Also, John hosts hypnotism stage shows. 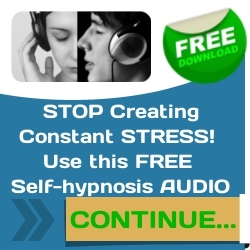 He is author of Hypnotic Scripts That Work – A hypnosis script encyclopedia for professional hypnotists now in its sixth version. Navy, Retired is a Board Certified Hypnotherapist, Advanced Practice Nurse, Certified Hypnotherapy Instructor and Certified Registered Nurse Anesthetist. He has served as Chief Nurse Anesthetist, Assistant Department Head for Administration Naval Medical Center Portsmouth, Portsmouth, VA and is the Past President, Virginia Association of Nurse Anesthetists. He is Owner/Director of Healthy Visions Wellness Center in Oak Ridge, TN USA. Ron is the leading authority on using hypnosis for pain management and for anesthesia. Martin Kiely Hypnosis Centre, Cork, Ireland is totally committed to ensuring the very best professional hypnotism service. For your hypnotism services in Cork, and Ireland, sometimes it’s better to talk to a real expert and trusted authority in the hypnotism profession. 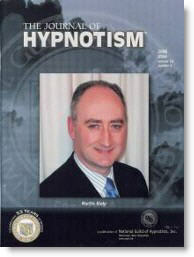 Contact Martin Kiely Hypnosis Centre today for further information or to discuss your hypnotism service options.